This set-up is sure to create a talking-point! 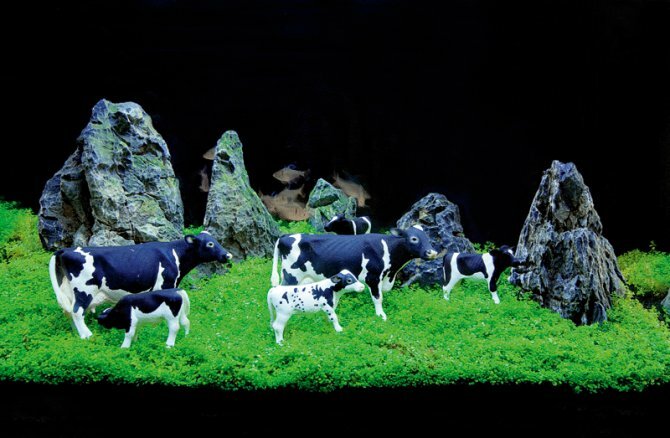 Combining modern planted tank practices with a bit of tongue in cheek design, you can mix this classic Japanese iwagumi, rock garden style with some plastic farm animals to replicate German aquascaper Oliver Knott and his infamous animal creations. Choose from cows, tigers, pandas or whatever takes your fancy! Check first to ensure that anything you add won’t harm the fish. For your artificial pasture, complete with herd of farm animals, grow the plants in well first, then add the cow ornaments at the end. That way you will get an even carpet of plants and no algae growth on the backs of the animals.